Bryan Berg’s recreation of the Dallas skyline used 1,060 decks of cards. That’s more than 55,000 playing cards. Berg, a Guinness World Record Holder at age 38, maneuvers around his freestanding constructions using ladders or scaffolding. 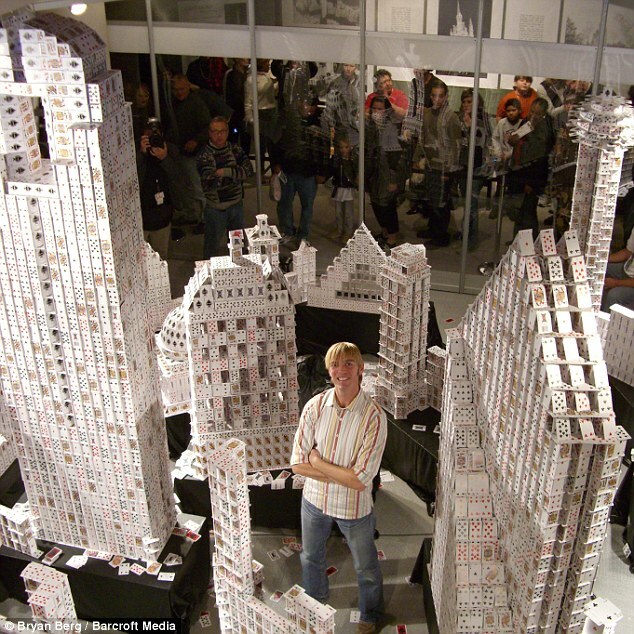 His tallest creation, the Dallas skyline, is more than four times his height, towering at 26 feet – the holder of the Guinness World Record for Tallest House of Cards. Hotels, television networks, and city governments approach Berg with requests for replicas of existing buildings or objects, like creating the largest casino in the world – the Venetian Macao Resort-Hotel in China – during the Chinese New Year in 2010. 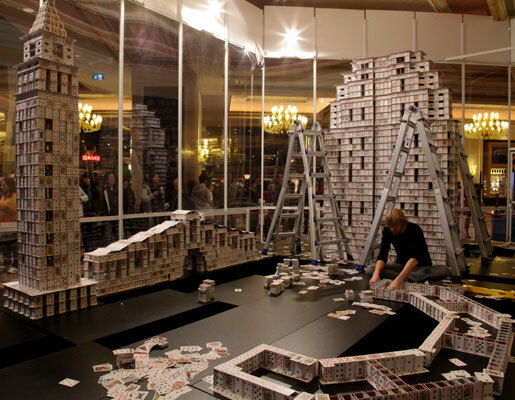 It took almost two months and 4,000 decks of cards to construct. Below, Berg describes his 7- or 8-hour workdays, which he mostly spends in silence (except for crunch time, when he cues up electronica on his iPod) and wearing socks. Previous jobs: I worked at my dad’s construction company throughout high school, college, and even after. That was part of what allowed me to get my footing with cardstacking. I captured my [first] Guinness World Record in 1992 when I was a senior in high school. It was 14 feet and 6 inches tall, much higher than anything I had ever built before. But my first paid project didn’t happen until two years later. Berg built the Beijing Olympic Village at Langham Place Kowloon, Hong Kong’s largest shopping center, in celebration of the Beijing Olympics. Did a passion for architecture segue into cardstacking, or vice versa? My interests in the built environment led me to cardstacking, and cardstacking led me into the pursuit of architecture. When did you realize you could make a living by stacking cards? Well through college – if not, after. I considered every project to be an anomaly. Over time, I realized it was more than a fluke, and I took it more seriously. Do you use novelty cards? Initially, I used whatever I could get my hands on – the cheap decks from the local grocery store. But that created a problem, since [each card] varied in quality and characteristics. So I partnered with this Belgian company Cartamundi to create cards with the ideal height-to-width ratio. I also worked with them to create a special buildable set, with a patent-pending gadget – it’s essentially a training wheel to learn how to stack cards. Do you use any gadgets? No. But I’m not placing cards in a random or haphazard way – I design every single arrangement in a geometric and orderly method. But there’s no bending or manipulation of cards. Your technique: There are two principal ways to stack cards: horizontally and vertically. I use both. I also produce a computer-generated rendering for my clients, but the finer points take a lot of improvisation. The musical analogy is that you’re given the time frame and key signature, but you have to fill in the notes. The deconstruction process: I don’t get upset about knocking [a project] down, as long as I’ve got some good pictures. It’s part of the process; it doesn’t feel complete until I’ve knocked it down. I usually use a leaf blower. It really requires that much force? A common question I get is, What if you sneeze while you’re working? 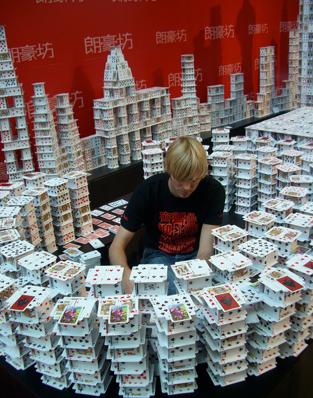 People don’t realize that a house of cards is very heavy – hundreds and hundreds of pounds. A sneeze won’t do anything. Any damage while I’m building is isolated; it doesn’t spread because of all the partitions. Best part of your job: Being able to be artistic and to do what I like. Most challenging part of your job: When people come to us without a clear vision of what they want, or too hardened of an idea. What would people be surprised to learn about your job? Actually stacking the cards takes a pretty small amount of time compared to planning and coordinating with everyone involved. My wife, Kristin, holds up the business end of things. Replicating the Venetian Macao Resort Hotel, the largest casino in the world, took 44 days, 219,000 cards, and set a new Guinness World Record for Largest House of Cards. How do you navigate around structures that are taller than you are? With ladders or scaffolding. You don’t want to stack yourself into a corner. Have you dabbled in real bricks and mortar? I’m actually building a real house for myself right now. I’m the general contractor, so I have a crew. Any interest in Netflix’s House of Cards? I’ve heard about it, but haven’t seen it. Some structures must be impossible to recreate using cards. Yes, like the Statue of Liberty’s arm or the Golden Gate Bridge or an airliner’s wings. There’s nothing to support it. Your required reading: Screw It, Let’s Do It by Richard Branson. It’s about how he made his life fortune by going against the advice of his financial advisors. Your favorite architectural work: The temples at Angkor in Cambodia and the wooden architecture in Japan. How do you calculate your rates? It’s a day rate that includes any travel costs. A big part of this is learning to suggest a reasonable price that isn’t a rip-off for [the client] or for me. Over time, you learn what something is worth. Look at the work of others, but realize that sometimes the best ideas might not come from the human element. They might be outside in nature or in some totally unrelated realm of data or experience. Follow Bryan Berg on Cardstacker.com, his Facebook page, and at @cardstacker on Twitter. Next: Meet the SNL cue cards guy, who makes a living with a very different type of cards. This entry was posted in Art and Design, Cool jobs, Crazy jobs and tagged bryan berg, cardstacker, guinness world records by Megan Hess. Bookmark the permalink.